My school is fortunate enough to provide students with personal computers for use in the classroom and at home. Internet is provided to students in the building and is used to distribute information to students, write papers, perform research and similar educational tasks. Teachers are provided iPads to use in class which can be synced with the classroom display (60 inch LCD display). Additionally, classrooms are equipped with speakers which is attached to portable microphones which teachers may use to amplify their voice in the classroom. In this class, the teacher distributes notes and scaffolds the class activities by distributing a OneNote document which is a note taking document by Microsoft. Teachers can add graphs, pictures, full documents and sound files to the OneNote file and easily distribute the information in an organized way to students. During this class period, students were asked to type their responses to an initial thinking question and then the teacher debriefed student responses as a class. When interviewing a student, he responded that typing responses to the initial thinking question versus writing them allows him to express his thinking more quickly and can write more information down. The hope of the teacher using the OneNote is that students can take notes in between the information provided. The notes are not collected, but provide students a resource to be able to search their notes and include supporting documents between their notes. Today, the activity was a lecture about living conditions on Mars, the document in the One Note was a table set up as Two-Column notes. The teacher scaffolded the lesson by providing the information on the left column (the topics covered in the lecture) and the right was to be filled in by the students during the discussion. When talking with the instructor, before the school had computers for students, she would have printed and distributed the notes outline to provide students a tool to learn from the lecture. During the lecture, the teacher utilized her iPad. She had a PowerPoint Application which allowed her to control the slideshow remotely as she walked around the class. During the lecture, the teacher weaved in and out of the students to see what they were doing and take corrective action. This tool also had a laser pointer function that allowed the lecturer to highlight an area of the screen she wanted students to pay attention to more closely. Additionally, the use of the iPad and the many applications helped switch between tasks gracefully without significant transition time. Within 30 seconds, the teacher moved from her PowerPoint presentation to a Word Document (to inform students of what good research looked like) to an excel file to display team groups. I think this was a good use of technology to aid in classroom management. Finally, one low tech piece of technology that was used in the class was a microphone to amplify the teachers voice. Microphones are used by many teachers at the school, they help create clarity of instructions and teachers don’t strain their voices to talk over students. One improvement I would make as the teacher using a microphone would be to repeat what students say a when the student is not using the microphone. This way everyone can hear students comments loudly and clearly. One downside to the use of technology in the classroom is when the tools don’t work. LanSchool is a tool which provides teachers an overview of what students are looking at on their computer. This technology is currently unavailable so students easily take advantage of the computer use and look at non-school related sites. This can be challenging for teachers if they are not careful at monitoring student computer use. While technology has it’s benefits because students can access many sites for information, it also presents problems when trying to teach and students are off track. Students even claim that they computer use can be distracting, one student in particular claims he is easily distracted by his coding (Java Script). In all, technology has improved classroom culture and provides different learning opportunities, there are also unique new challenges that also detract from information. Many of these tools are classroom management tools and few are subject specific contributing to the unique needs of the specific lesson. This observation compares two very different types of instruction instruction strategies between STEM related topics. The first strategy is project- and inquiry-based instruction the other is a game to demonstrate a concept. In the first class, a class titled “The Physics of Flight,” students are tasked with creating a protection system for a payload on a bottle rocket they will launch at the end of the week. Students are provided a budget, materials and a critical friend who must approve the design before the build. Students must use their knowledge of drag, friction, air pressure and mass (topics of physics) to design their payload protection system to minimize damage. Students who are careful with their design and focus on the prior knowledge built more robust systems. The project is a long term project where students will revise their plans and rebuild their payload protection system many times as they learn more about the physics required for flying and space. What I like about this project and instructional strategy is that it is very real world. Students have to work within a budget, they need to be creative, their plans need to be approved by a critical friend and finally they can actually build and test their end product and have the opportunity to revise their original plans. I asked a student about what they would do differently, they mentioned that they would not have used such heavy material to protect their payload because the mass is difficult to slow down when the object is falling. They need a lighter protection system to be slower. I think these students are really learning about the concepts of physics in a real world environment. Some students were confident in their protection systems and the teacher didn’t challenge their thinking much after they took their mind off the task. If I were to provide feedback I would encourage this teacher to talk one on one with the students who claimed they were done and ask them about how their learning changed design elements on their product. This would re-engage these students who felt they already knew how to do the activity well. I think that mathematical modeling is one of the most useful applications of math, so I may use the project based strategy to provide a project for my students to apply their math knowledge to the real world. The other instructional strategy that I observed was a game to unpack a scientific concept. The students were studying the carbon cycle and the teacher wanted to emphasize that particles of carbon get stuck in different areas. For instance, carbon that forms oil will be stuck in the ground for a long time until it is drilled up and then moved through the air as oil emissions. Students played a game were each student was a carbon molecule and they started evenly distributed. Students would roll dice and read a legend to determine their fate as a carbon. Some tabled became very full while others were less full because carbon stays in certain forms longer. Students recorded their fate and then at the end of the game the teacher had students discuss what happened to their molecule. I think this was beneficial since it was an activity where students could move around the classroom and see/feel what a carbon would be in the larger scheme of the carbon cycle. I especially liked that the class debriefed the activity so that those student who could not make the conclusion about the activity could be clued into what learning was supposed to take place. This type of activity could implemented in a statistics unit where randomness can be visualized. Between these two instruction strategies, I think they were both effective because they had clear goal for the students and were well planned out. Students were able to articulate the goals of the activity and the activity was differentiated so learning could be achieved despite different learning styles. The take away from these observations was that I need to incorporate more movement into my classroom and differentiate instruction with intentional activities for students. At the end of, or near the end of each academic quarter, the National Honor Society hosts a game night for students to relax and play games, toss a frisbee and hang out with peers in a non-academic setting. The Spanish instructor was the primary supervisor for the event and explained that the game night was a regular event that many students enjoy. About 20 students stayed after school (which ended at 2:00pm) until about 5:00pm to play video games and relieve some stress before returning to work, school or the stressors of home. I really enjoyed seeing these students interact with one another outside of the classroom. Leadership traits were much more clear and they didn’t have their guard up constantly like they do when they enter a class. Two students stand out in particular that were much different at this event than they are in the class where I teach. One student is a high achieving student and tends to focus deeply into his work was smiling and jumping around. We played a small get to know you game and another game of hot lava. The quiet student demonstrated many leadership qualities which he doesn’t have an opportunity to share in class. The other student is also quiet but tends to struggle focusing on tasks in class. At the beginning of the year, this student really struggled to complete homework, but has since been improving. At this event, he was interesting to watch as we completed a hot lava activity where students can only stand on chairs and must transport their entire team from one side of the room to another only using the chairs as support. Since standing on chairs is generally unacceptable during the school day, this student felt more comfortable and was determined to help his team accomplish the task. He encouraged others, something he wouldn’t normally do in class, and focused to help his team win. Overall, watching and participating in this after school event really taught me about the multiple facets of student’s lives. They share different parts of their personality through different activities. I feel as though I know these several students a lot better having spent time in a casual environment with them. Additionally, I think we have a stronger relationship. Yes, I’m still their teacher, but they know that I can also have fun, dance and play games. Possibly, the students who attended this event and are in my classes will trust me more when they have questions, concerns or problems they need advice solving. By participating in extra curricular activities with students, I have opened more doors to knowing students better. This observation was completed at a school other than my internship. This school is a typical larger high school with about 1,200 students and many math teachers. Before school started, I had an opportunity to look around the classroom and talk with the teacher. This teacher LOVED Wong & Wong’s (2009) First Days of School Book which we are studying in the Classroom Management Class. When looking around the classroom, the teacher had the activity, warm up standards and homework posted for students to see a forecast of the week. Ms. P was very clear with her students about expectations, she had many graphics about the procedures of her classroom. As the bell rang, she posted a small picture under the document camera which instructed students to turn their phones off, get materials out, homework out and begin the entry task. Each student had an assigned seat which they were expected to sit in. According to Wong & Wong (2009) this is to establish some control within classroom and maintain authority as the person in charge. In the classroom, a large calendar was posted to emphasize upcoming events in the class, such as quizzes or days off school. The current date and the day’s bell schedule was posted (rotating schedule for the school). During class, students filled out an activity sheet where Homework was to be recorded and a grade for completion would be posted. 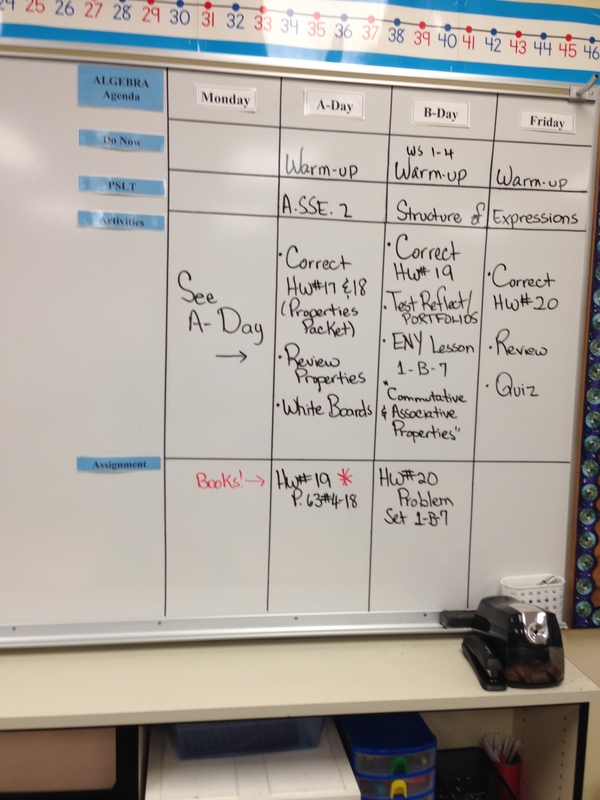 Students self-assessed their effort on the homework (4 – All work shown and all problems attempted, 3 – Almost all, 2 – Half, 1 – No work shown, 0 – Not completed on time). This school district requires teacher to use standards based grading, all students are graded on a 4 point scale for all of their work based on the standard for the assignment or test. One of the most impressive elements of classroom management was the use of students to help run the class. In the first period class, two students were brand new to the classroom. One of them spoke no english and didn’t understand all of the procedures to the classroom. Ms. P has trained her class so well, that she asked a reliable student to show the new students around and explain the classroom procedures. New students were prepared for the next class with the help of peers to obtain a homework assignment sheet, worksheets for the class and tools for completing the in class assignment. This seemed to take a lot of stress off of the teacher in the classroom and allowed them time to instruct the whole class. 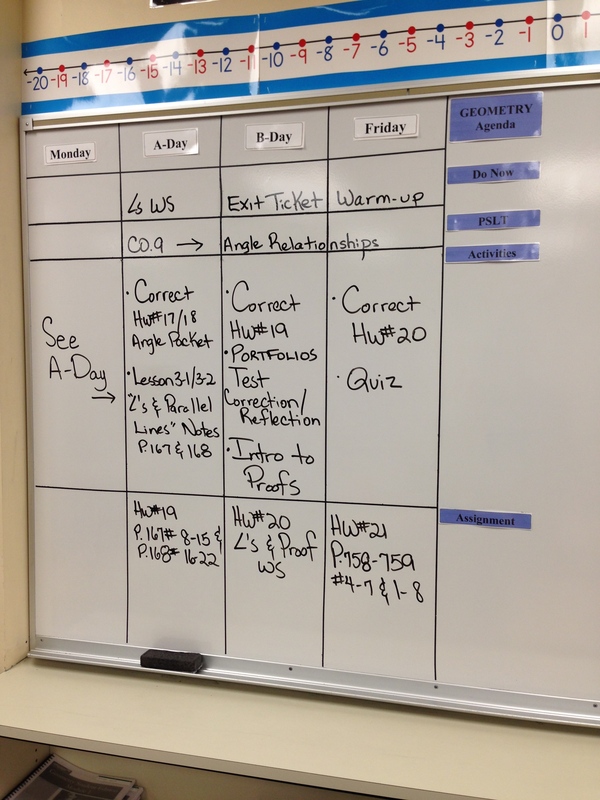 Having such a strong routine and organization seemed to really help the effectiveness of this classroom. The power of organization as an element of classroom management became very clear when a portion of the lesson was not as well organized. Ms. P was preparing students for Student Led Conferences when she became slightly confused by the procedure and how to instruct the students. During this period, student’s didn’t know what to do and the class was not as productive as other times during the period. This shows that organization makes a HUGE impact on classroom management. My last two take aways for classroom management include providing crucial feedback to students when passing tests back (i.e. please include last name, no pens on assessments) so students are clear about their expectation for their assessments. Finally, Ms. P has a quiet space in her classroom where she will stand when she expects the class to be silent. The space is separate from her instructional area and prominently placed near the front of the room so all students can see. This is an excellent nonverbal way to communicate to students that you need their attention. Based on my understanding of Wong & Wong (2009) and Ms. P’s classroom management plan, this was nothing like I expected, in the best possible way. The theory from the Wong & Wong book really works well. According to Ms. P, first period is a challenging class and I was surprised that she said that because the classroom was running so efficiently. I’m confident with the students attention, this class will make very large improvements, especially with a teacher as organized as Ms. P.
Wong, H., & Wong, R. (2009). The first days of school: How to be an effective teacher. Mountain View, CA: Harry K. Wong Publications. In this class, the lesson was to review previous learning in preparation for a test the next day. When talking with the teacher the day before, the lesson was intended to be a socratic seminar, however, immediately before the lesson, a pedagogical decision was made to have the discussions be made in small groups. The questioning from the instructor was more general than asking several smaller questions but instructed students to discuss broad, open ended questions as groups. Questions included What need does the hero fill to fit the needs to their time? What does Gilgamesh give to his society? Who are the three most likable heroes? Why/ Which are the most intelligent? Why? What role does technology play in how stories are told throughout the ages? Observing teacher behavior during the group responses to the question was the most interesting. The teacher consistently talked with table groups of about six or fewer and did not choose to talk as frequently with larger table groups. When she talked with each group, she probed only a few new questions, but generally retold some of the stories that were discussed in class. Questions generally were open ended (about 80%). Some of the closed questions were implied to have support, for example, choosing three heroes implied some justification as to why those heroes were chosen. In general, since the questions mostly guided group discussion, there were no repeated answers, some groups received more attention than others, but overall the questions were dispersed around each student. The last section which asked students a more sophisticated answer was conducted as a group debrief where some students shared out. All of the students that shared to the class were from the large group, 1 one female and three males (this mimics the gender makeup of this school). In talking with the teacher about the purpose for her questions, she responded that they were strategic in eliciting specific knowledge from the students and were intended to recall important, more synthesis of information was required to demonstrated understanding. To ensure complete understanding across all of the groups, if I were to implement this technique in my classroom, I would like to debrief all questions, not just some of them to create a collective understanding of the important concepts for a test. While such broad questions may not be useful in a math classroom, I think the group questioning is a valuable tool that can be implemented. I could provide a group problem and then circulate the classroom to check for understanding. A creative tool for helping student understand gar fundamentals of a mathematical concept is to have them explain their ideas as they would to a younger student. This generally required significant understanding to accomplish. I enjoyed the use of this teachers questioning to prepare students for a test, I can use some of these group question strategies in my own classroom. Each morning, students are expected to enter the class and start on the entry task (ET) which is posted on the display in the front of class and is also posted on the class website (each student is provided with an internet capable laptop). For this lesson, the ET stated, “Explain how similarity of triangles is related to trigonometry.” Students write their response to the task in their homework notebook and should be writing for about five minutes. During this time, the teacher took attendance and spent a few seconds preparing the lesson. After the writing period, the teacher interrupted the class to debrief. He asked students, “ What do you suppose todays activity is about?” the conversation lead to a short discussion of “similarity.” he probed students, “Why do we care about similar? and What else?” Students volunteer responses to these questions. After the debrief finished, the day’s activity was introduced and students began working. The objective was never explicitly stated, although the introductions to start the class was a brief indication of the objective for the class period. During the lesson, I asked students what the objective for the day was and several were able to produce a sufficient explanation as to the goal of completing the activity, but it was not completely accurate. Today was the end of a unit lesson and I would say that the ET prompted students to reflect on previous classes and learning about the relationships of triangles to completely answer the question. Since this lesson was a summary of many lessons, the opener was more theoretical than it has been in the past, so the authenticity and engagement were slightly lower than more application style lessons, however, the ET made a strong segue into the objective of the day’s lesson. I would have liked to see more explicit indication of the day’s goals. If I were to teach this lesson, I would have written something down on the whiteboard. I really liked that the teacher had the students articulate the purpose and the objective of the lesson. This indicated that students were aware of the lesson and the purpose for the day’s activities. About ten minutes before the class was completed, the teacher held a debrief of the activity, he asked questions such as, “What was The Sim’s activity about?” and encouraged a response which aligned with the objective for the lesson which was similar triangles and trigonometry. He then extended the question with “Anyone want to add anything?” which I liked because it gave students another opportunity to share their learning and responses. Another regular routine for this class is Journal Reflection (JR) in a special notebook kept within the class. Students are aware that they are graded on the effort and thoughtfulness of these daily entries. The goal of a JR is to help students articulate their learning and misunderstandings from the days lesson. The JR is posted on the screen at the end of class. Students know they are expected to be writing on the topic for the last five minutes. The JR for this lesson was “Explain how to use similarity of triangles to solve for unknown parts of a triangle.” This particular closer helped students reinforce the practicality of similarity as a form of trigonometry. In fact, this JR helped summarize most of the unit and goals which followed the Understanding by Design model. During the students JR time, the teacher talked with single students which I think was a little bit distracting to the whole class and made the JR time less valuable. I did not like this because it took away from the reflection time for students who are easily distracted. After the class, the teacher mentioned to me that he wished the students had a more fundamental understanding of what trigonometry was and that even through this lesson, some students are struggling. This lesson was aimed to meet analysis and synthesis in Bloom’s Taxonomy. Students were tasked with recognizing patterns in the activity and the opener and closer helped them see more patterns and create more sophisticated conclusions based on their engagement with the activity. I really liked that students reflect on their thinking and that they are engaged with prior knowledge to start and end every class. I particularly liked the debrief period because it engaged students and had them articulate their learning and the connections they were making rather than being provided the correct objective. Overall this class was well executed and the opener and closer helped motivate the days activities and facilitated strong learning on many levels of engagement. Today’s goal was to follow the school day of a sophomore student throughout their day. To protect the identity of this student they will be called MW. The goal was for me to observe five different classrooms during a six period day. Within each class, I was looking for teaching strategies and tools to use in my own classroom. At the end of the day, I asked MW some questions about their day. While the student interview was only a case study, MW provides several helpful suggestions to improve their learning experience. The morning classes include Math, English and Biology. Within all of these classes, I noticed good responsive listening. Teachers would ask student questions and then summarize what the student said and repeated the comment to the class so all could hear. In English, the instructor was careful about making smaller comments to encourage conversation in class. The activity in English was to analyze a short story, a topic which can be shallow or deep depending on the students’ understanding. The instructor contributed to the classroom discussion as well to prompt students to analyze the short story more deeply. At the end of the classroom discussion, the teacher make a more sophisticated analysis than the students were able. This exposed the students to higher expectations. The teacher used OneNote to distribute materials to students and students were able to access copies of the teachers journal. In math class, students started with an entry task to summarize their homework and clarify questions. The class activity was to debrief a challenging problem from the homework and clarify understanding of the basic elements of trigonometric ratios. Students had questions to prepare for a quiz the next day. The activity included a worksheet where students needed to use prior work to plot data and discover a relationship of a sine wave. The end of class, summarized their understanding of “accuracy” and careful procedures for getting more reliable results. Biology was a very busy class, the lesson was very engaging and highly differentiated. One comment about the lesson that I particularly enjoyed was the presentation of the entry task. The day’s objective was clearly posted on the board and students were able download a copy of class activities from OneNote. Student’s shared out the Initial Thinking questions by popcorn method, students would choose others to “keep the conversation going.” The instructor was clear about the importance of understanding the Carbon Cycle and other biological systems and stated that this would be tested on the End of Course Assessment (EOC). The class activities included a dice game and students would mimic a carbon molecule in the journey throughout the day. Students seemed to enjoy the activity and learned about the many processes of the carbon cycle. Students were able to articulate what happens to a carbon atom as it moves from the sun to plants and then into animals and back into the atmosphere. The activity was followed by a debrief so students could articulate their learning. After the debrief, students watched a video that repeated the material again. This instructor was very smart about providing many learning opportunities for important content. The class ended with an exit slip that informally assessed students learning from the day. Students were instructed to make a carbon cycle as homework to use to prepare for their EOC test in the spring. After lunch, MW was schedules to attend Current World Problems, Spanish and Health. Mostly, this class period was work time for students to finish a group project about government systems since 1500. MW shared with me the group project and the required elements for a grade. Before work began, students the teacher had a student present a “SHIELD” which allowed the student to comment about their past present and future. The intention of the exercise if for the class to know each other better. Students can share about their interests and goals. Next the teacher gave instructions of work time, he was very clear about presenting a product at the end of the period and made suggestions for groups to produce exemplary work (i.e. Review each other’s papers, get organized and then work together to produce a product). Essentially, the teacher anticipated potential shortcomings and took preventative measures to work through the project. We also talked about some of the functionalities of the grading system to optimise its use. Next was Spanish in which students entered the class and listened to the instructor through an immersion lecture. The teacher spoke little english when teaching the material, but frequently broke into english to emphasize important points. He continued to discuss why immersion was used and why he believed in this philosophy for language acquisition. Most of this period was direct instruction and lecture based. Students did not respond frequently and when they did, it was brief. The last class was Health where there was a lot of individual work time. Some of the lesson was direct instruction where students had access to a OneNote document to help follow the lesson and take notes. The period was an introduction to nutrition and involved the explanation of a project. The teacher clearly displayed the objective and the required elements of the project so that students knew what was expected of them throughout the unit. Many students who were in previous classes were also in this class. It was interesting to note the difference in classroom dynamic because of these students. Those who were quiet in the morning, we not more rambunctious and hard to get back on task. Teachers should consider this when teaching. Finally, after the day, I asked MW some questions about their day. This student liked the biology lesson because there was an activity where she could move. She mentioned this was uncharacteristic of her typical day, but when she moves around, she claims she remembers more. Typically, she enjoys her math class because there are clear instructions and she tends to work hard. MW is also in a robotics class (which I did not attend) but this takes up a lot of her time. Sometimes teachers don’t understand that this is a challenging workload. Along these lines, MW claims that she becomes overwhelmed when projects are overlapping and she does not have the tools to manage this better. MW recommended teaching students in advisory time management and note taking skills. She also would like a space after school to get some work done and manage her schedule. Throughout the day following the student, I realized that the school has very high expectations for the students and teachers don’t often repeat information. This school expects students to understand verbal instructions the first time, which is a challenging skill for many people, even adults.